Single Row Deep Groove Ball Bearings are the most common bearing type in the world due to their versatility and performance. 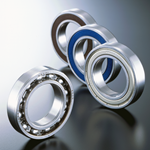 These bearings are available in a variety of seal, shield and snap-ring arrangements. Bearings with seals or shields are standardized and already contain the proper amount of grease. Open bearings will require lubrication. 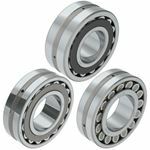 These bearings can sustain radial and/or axial loads and because of their simple design, this bearing type can be produced to provide both high-running accuracy and high-speed operation. Double-rowed Spherical Roller Bearings are the workhorse of the industry. Their barrel shaped rollers and spherical outer ring raceway permits this bearing to operate with misalignment with no reduction in bearing life. Spherical roller bearings are used mostly in heavy-duty industrial applications where extreme radial loads exist. They also excel in handling axial loads in either direction, contaminated environments, misalignment, shock loads and vibration. Nachi Sphericals are manufactured in a number of design and material configurations depending upon the type of application and the size of the bearing. Most come standard with a lubrication groove and holes (W33) on the OD of the outer ring. Symmetrical or Asymmetrical (A) rollers may be used with stamped steel or machined brass cages. The “EX” design uses larger diameter rollers for the highest load ratings. All bearings are heat stabilized to at least 200°C (about 400°F). Some sizes may be available with tapered bores (K). Depending upon design, stamped steel or machined brass cages are used. Commonly used in gearboxes, wind turbines, pumps, mining/construction, marine propulsion and drilling equipment.